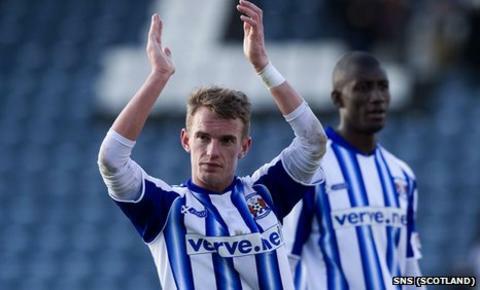 Dean Shiels has signed for Kilmarnock until the end of the season, having terminated his contract with Doncaster. The 26-year-old attacking midfielder spent the first half of the season at Rugby Park, scoring six goals. And he will be joined by Chelsea left-back Ben Gordon, who is returning for a second loan spell in Ayrshire. The 20-year-old was with Kilmarnock during the first half of last season and has since had temporary spells at Scunthorpe and Peterborough. Kilmarnock manager Kenny Shiels was delighted to have retained the services of his son, saying: "Dean's severed links with Doncaster. They've been very co-operative and I must give them praise. "It was long and drawn out, but it got to a conclusion and he's signed with Kilmarnock until the end of the season. "I would stress he's taken a massive financial hit for that, not because he's my son, that's just the truth. "People will say the father-son relationship is the heartbeat of his decision - it's not! "I think he's got attached to the Kilmarnock supporters and the club and he's taken a financial hit for this. I'm proud of him because he's done something for a football reason." The Killie boss admits his personal relationship with Dean has changed since he became a player at the Rugby Park club. "The thing I've found the strangest is that I spoke more to him when he wasn't my player. I was always asking him how he was getting on. "But now that he's here, the relationship gets a bit more detached where your conscious he's a player and he's conscious I'm his manager. It sort of swings more towards that relationship." However, the signing of Shiels does not mean the Killie manager will drop his interest in trying to secure the signature of former Celtic and Hibs striker Derek Riordan. And he predicts an understanding from their time together at Easter Road could be beneficial to Killie. "I'm still very interested in Derek because you could see the telepathic way they played when they were at Hibs," explained Shiels. "Both players make co-ordinated movement off each other and certainly they are good for each other. "They are intelligent players and that can only benefit our team." Shiels also revealed that he hoped to complete a deal for Scunthorpe defender Michael Nelson later on Wednesday.